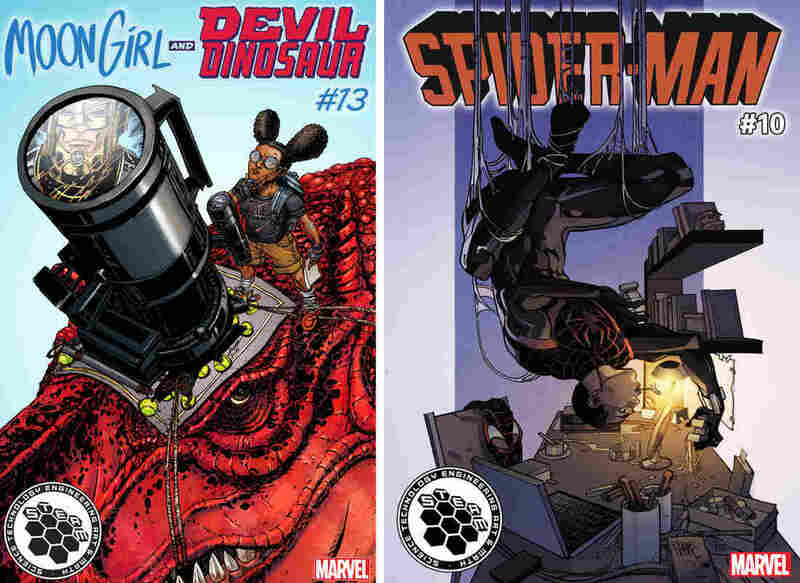 A Hero For The Arts And Sciences: Upcoming Marvel Covers Promote STEAM Fields : The Two-Way The five covers feature the company's heroes — including Spiderman, Iron Man, and the Hulk — all engaging in activities educators have been trying to promote. Invincible Iron Man — featuring the debut of a new hero, Riri Williams — is one five books Marvel is using to promote science, math, and arts disciplines through a series of covers. Typically superheroes spend their summertime helming big budget franchises for movie studios. This year, with blockbuster season winding down and schools opening their doors, Marvel's following up its summer at the multiplex by giving its superheroes a new assignment. Last week, the publisher unveiled the last of five special covers featuring disciplines that guide school curricula nationwide — Science, Technology, Engineering, Arts, and Math, also known as STEAM. It's part of an effort, the company says, to encourage young readers to double-down on their studies and explore fields said to lead to better jobs. "We plan to continue to motivate our fans to explore their passions in the fields of science, technology, engineering, art, and math and present these disciplines through some of our favorite young heroes who are doing just that — following their dreams and preparing for the challenges that await them ahead," David Gabriel, Senior VP for Sales & Marketing of Marvel Comics said in a statement. Available in November, the covers are alternative prints of several titles. Famous heroes such as the Hulk and Spiderman make appearances. 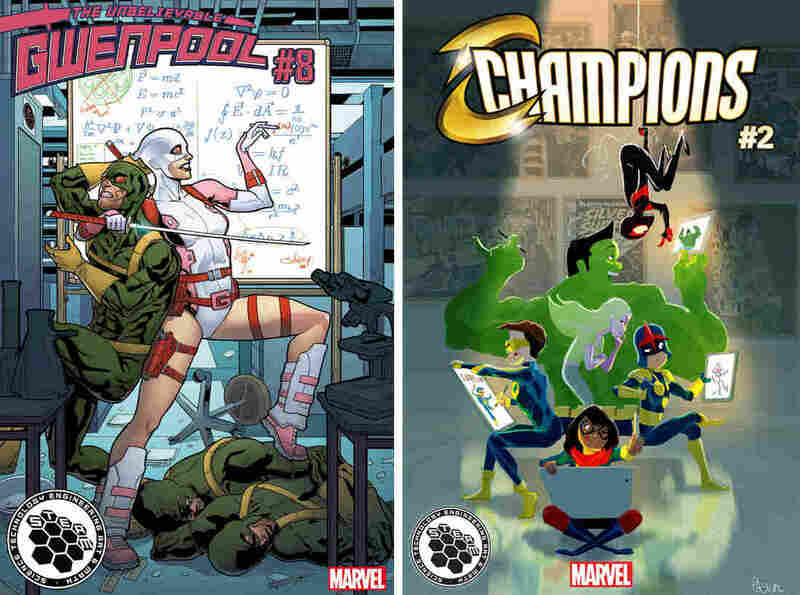 So do lesser-knowns Gwenpool — an amalgam of Spiderman's Gwen Stacy and meta-jokester Deadpool — and kid genius Moongirl. 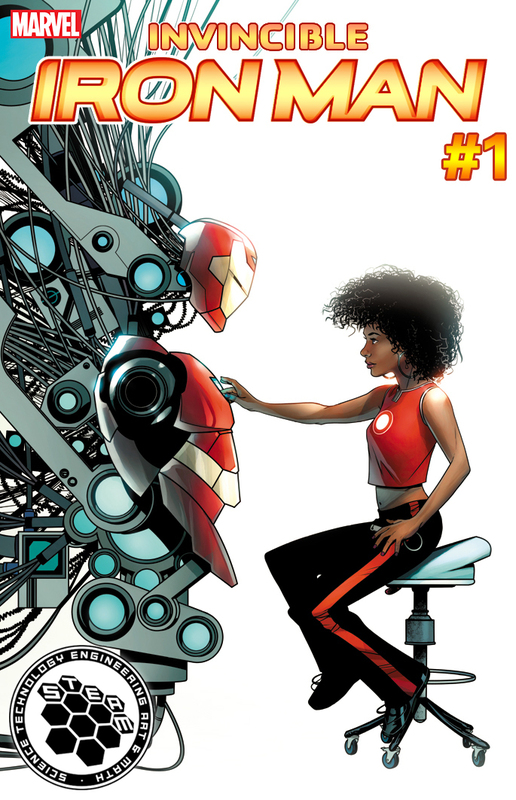 The covers also coincide with the debut of Marvel's new Iron Man, Riri Williams, a 15-year-old engineering prodigy, who is also featured. Readers may notice that Marvel's tapped a diverse field of heroes for the covers — characters Riri Williams and Moongirl are African-American, and Spiderman Miles Morales is of Hispanic and African-American descent — all working in fields in which educators and officials say women and minorities are underrepresented. "The media literally shapes what people aspire to be," said Virginia Booth Womack, president of the National Association of Multicultural Engineering Program Advocates. Womack also oversees recruitment and retainment efforts for students from underrepresented communities at Purdue University's College of Engineering. She says part of getting students to feel like they belong involves seeing people who look like them engaged in their field, in their own communities and the wider culture. "The power that the media has to give students the opportunity to emulate is huge," Womack says. Keri Randolph, director of Innovation for Hamilton County Schools in Chattanooga, Tenn., says one thing she loves about the comics is they're depicting women and minorities. The other, she says, is that the comics are putting science upfront for students. "When you go to the movies or read a comic there's such a suspension of disbelief. We don't necessarily pause and go: 'that already exists or it could exist,'" says Randolph. Marvel is not alone in underlining science in pop culture for the sake of engagement. Last year, the National Science Foundation partnered with with the National Nanotechnology Initiative to challenge high school-aged students to consider nanotechnology by creating a superhero who'd express what the field could accomplish. Entrants ended up thinking of ways nanotechnology could be used to fight cancer and eradicate waste. And Jacob Clark Blickenstaff, a program director at Seattle's Pacific Science Center, regularly incorporates pop culture in his approach. Writing a column for the National Science Teachers Association, he regularly points to lesson plans teachers can extract from popular entertainment, even when science is apparently absent. "They've been watching Frozen so let's talk about what ice is really like," says Clark Blickenstaff. Unsurprisingly, drawing from the artistic imagination to spur kids into scientific thought is a view that resonates with proponents of the STEAM curriculum, which adds the arts to the well-promoted STEM — Science, Technology, Engineering, and Math. "How do you solve these problems we're going to have in the future like clean water and climate change? It requires a lot of imagination and creative thinking to deal with these global challenges," says Babette Alina, director of policy for the Rhode Island School of Design. The art and design college has been working to integrate science within its curriculum, having students enroll in courses that direct their creative skills toward the sciences and seeking grants to fund interdisciplinary programs. But as vital as ensuring potable water or rolling back the effects of climate change may be, they lack the whizz-bang factor that enables Captain America to wield his shield or Spiderman to use arachnid-like powers to catch bad guys. Neuroscientist Paul Zehr, a pop culture blogger for Psychology Today, has written two books on the science of superheroes examining existing technologies that would allow Batman to sustain his nightly duties and Tony Stark to build an array of armored suits. "I think too often that's the part that's missing," says Zehr about engaging students. "They don't get the imaginative part." What comics and pop culture can do is allow imaginations to run unconstrained, Zehr argues, sometimes letting them predict technological advances before they happen, like Star Trek's communicators — or an example Zehr points to from Iron Man. A comic from the early 1990s depicted schematics for Tony Stark's titular suit. Then in the 2000s, Zehr found an academic article on brain and machine interface — and it bore a striking resemblance. "Science is what-if," Zehr says. "What if this works? What if I did this in my lab tomorrow?"